The twenty essays in Text, Performance, and Gender in Chinese Literature and Music: Essays in Honor of Wilt Idema, arranged in rough chronological order of the topics treated, examine a rich array of questions: performance, music, gender, poetic form, print culture, new media–just to name a few. With foci ranging from Tang poetry to Ming-Qing vernacular fiction to contemporary “web literature,” from canonical authors to marginal writers to internet forum contributors, these essays, as the editors of the volume put it, reflect “the sheer volume of primary sources now available in print and in searchable online formats [that] has enabled research on a ever wide range of Chinese texts and topics from antiquity to the present” (p. 1). 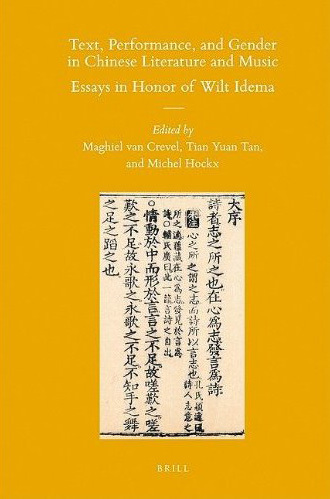 Indeed, readers will marvel at and learn from these essays, which were written in honor of Wilt Idema, a scholar and teacher of great breadth and depth who, through his research and his students, has influenced nearly every area of Chinese literary studies. One might in fact easily get lost in the sheer richness of the volume. However, among the essays there are several shared points, most notably, the three key terms referenced in the book’s title. Indeed, text, performance, and gender comprise a useful compass for readers navigating through the book, for the essays collected therein can both be distributed under either text, performance, or gender as discreet categories, while at the same time these three foci are significantly present in many of the essays, regardless of their ostensible categorization according to the volume’s title. First comes “performance.”Among the pieces in the volume, the ones treating music/sound from diverse perspectives particularly struck me. In her reading of Hong Sheng’s (1645-1704) Palace of Eternal Life, Ayling Wang examines music both as a theme in the play and as a key dramatic element, and this approach enables her to illustrate at once the multi-dimensionality of chuanqi as a composite art and Hong Sheng as a dramatist well versed both in dramatic poetry and in “tone, rhyme, and music” (p. 237). While literature still occupies a central position in Ayling Wang’s essay, David Der-wei Wang’s study of the composer Jiang Wenye (1910-1983) dives directly into the world of music. Wang does not exclusively address music, though. The vicissitudes in Jiang Wenye’s career and the formation and development of his musical style offer Wang a window into not only an individual’s life story and the ways he imagines his identity–cultural, ethnic and national–but also into the larger questions of modernism and modernity. In his essay titled “Rejective Poetry? Sound and Sense in Yi Sha,” Maghiel van Crevel demonstrates an impressive ability to describe and closely analyze sounds, offering the reader a substantial discussion of the intricate relationship between sound and sense both in general terms and in terms that are specific to Yi Sha’s poems. Methodologically, van Crevel gives priority to sound. Take, for example, his close examination of the poem “St-stutter,” a good example of what van Crevel terms “rejective poetry” (p. 389), and at the same time also demonstrates Yi Sha’s shrewd manipulation of the interplay between sound and sense (see pp. 394-405). Here it is the audio recording of Yi Sha’s recitation of this poem, which is made available online to the reader, that constitutes the focus of van Crevel’s analysis, while the written version only “functions in an auxiliary role” (p. 395). The concept of performance in this volume is not limited to the performing arts, but points to a wide assortment of ideas and issues. While Frank Kouwenhoven and Antoinet Schimmelpenninck’s study of the Guo guan (Crossing the Passes) Ritual Shadow Play of the Huanxian region in Gansu province examines the actual performance of the Guo guan ritual (see especially pp. 378-384), Shiamin Kwa and Xiaofei Tian bring into play other aspects of performance. In Kwa’s astute reading of Xu Wei’s (1521-1593) Zen Master Yu Has a Voluptuous Dream, performance means more than role-playing on the stage or the overall theatrical presentation of the play; rather, for Kwa, broadly defined, performance also points to intertwined issues of self, identity, and social and gender roles (linking this essay to those more directly concerned with gender), and thus constitutes a useful site for the examination of the interplay between the technical, representational, and thematic dimensions of the play. Tian’s essay also studies the question of role, but with a focus on vernacular fiction, which, like play, also “developed fixed role types” (p. 213). At the same time, Tian also emphasizes that “[u]nlike drama,… there is more room [in] fiction for fuzziness in the boundaries of role types” (p. 213). Indeed, her analysis of late imperial representations of sovereignty demonstrates that the characterization of the sovereign, who is often based on a particular historical individual, sometimes may be problematic since he may “not fit easily in any of the stereotypes” (p. 224) or may occupy “conflicting stereotypical roles” (p. 231). These three essays are not the only ones dealing with performance, but exemplify the diversity of the angles from which issues of performances are approached in this volume. As for the collection’s titular third term, “gender,” several essays are devoted to late imperial women writers, which has been among the most energetic and productive areas in the larger field of Chinese literature and culture in recent years. Ellen Widmer’s essay examines women’s literary culture in eighteenth-century Guangdong by comparing it with that in contemporary Jiangnan. Because women writers from outside the Jiangnan region have been relatively understudied, Widmer’s work on Guangdong women supplies a crucial piece that had been missing from the larger picture. Siao-chen Hu’s study of the Qing author Zhu Suxian’s tanci piece Linked Rings of Jade highlights the work’s uniqueness, which lies not only in the fact that its author is “the only woman author oftanci who did not maintain that she was a well-educated lady of the genteel class” (p. 311), but also in its unusual portrayal of “extraordinary yet marginal female characters” (p. 312). Beata Grant’s essay on the late Qing author Gu Taiqing (1799-1877) offers an introduction to, as well as translations of, Gu’s Daoist poems, stressing the role of religious activities in Gu’s life and the impact of her sustained interest in Daoism on her poetry. While drawing on existing scholarship on women writers, Widmer, Hu, and Grant all seek to move beyond familiar terrain: Widmer tries to enrich our picture of late imperial women writers by turning to a region outside the better known Jiangnan; Hu chooses to look at a less studied tanci author and the marginal female characters her work presents; and religion offers Grant a concrete way to examine a woman poet’s writing through her daily activities. Issues of women and gender are also central to Katherine Carlitz’s essay. However, unlike the three essays just mentioned, Carlitz treats a male-authored text, the late Ming, early Qing playwright Meng Chengshun’s (1598-1684) chuanqi play The Chaste Compendium. Focusing on the intertwined themes of passion and chastity, Carlitz contextualizes her discussion of these concepts by examining Meng’s play against the backdrop of the turmoil of the Ming-Qing transition, arguing that rather than being simply associated with the female protagonist, passion and chastity are treated in a way that shows Meng’s ambivalent mental state as a male “Ming loyalist who lives on to serve an alien dynasty” (p. 210). Carlitz’s essay thus straddles the dual issues of performance and gender, while including no small amount of textual history and analysis. “Text” is the first of the three concepts in the title of the volume. Indeed, quite a few pieces in this volume speak eloquently and in a variety of ways to the question of text. Tian Yuan Tan’s study of the relationship between Li Kaixian (1502-1560) and Revised Plays by Yuan Masters, for instance, relies on text-based analysis: his examination of “the textual relationship or lack thereof” (p. 150) between Revised Plays by Yuan Masters and Banter about Lyrics, whose editorship is also attributed to Li Kaixian, allows him to conclude that Li “was not as actively involved in the editorial process” in the former as in the latter (p. 152). In addition to written texts, essays in this volume treat a variety of other types of “texts.” For instance, the Guo guan ritual play that Kouwenhoven and Schimmelpenninck closely study and describe at length is an actual performance that they “witnessed and filmed” (p. 378). Some essays–e.g. the ones by van Crevel and Michel Hockx–engage new media. In his study of the contemporary writer Chen Cun and so-called web literature (wangluo wenxue), which has been crucial in Chen’s creative activities as an avant-garde writer, Hockx demonstrates the notable role that the internet has been playing in Chen’s effort to “uphold the avant-garde spirit beyond its supposed heyday in the 1980s” (p. 414), calling our attention to the links between new media and avant-gardism in China today. Furthermore, as noted above, music/sound performance constitutes the focus of several pieces, whose treatment of their source materials–e.g. musical compositions, audio recordings, and musical notations–also explicitly or implicitly address issues of text. A noteworthy aspect of this volume is its inclusion of quite a few pieces in which translation occupies an important position: Stephen Owen’s close reading and translation of Du Fu’s (712-770) two “Chusai” (Going out the passes) sequences of poems; Victor Mair and Rostislav Berezkin’s detailed analysis and translation of Bai Juyi’s (772-846) “Biography of the Maestro of Mellow Versification”; David Knechtges’s annotated translation of Luo Binwang’s (ca. 619-ca. 687) poem “Amourous Feelings”; Glen Dudbridge’s study and translation of Wang Renyu’s (880-956) memoir about the circumstances surrounding the fall of the Former Shu in 925; Robert Hegel’s introduction and partial translation of Qin Jianfu’s (fl. 1320) comic play The Elder of the Eastern Hall Reforms a Prodigal Son; and Kimberly Besio’s introduction and partial translation of Xu Wei’s play Singing in Place of Screaming. The editors of the volume take care to note that many scholars of Chinese literature, including Wilt Idema, see translation “as fundamental to scholarship, and as a particularly enduring type of academic community service to a wide range of readers” (p. 3). While reading through these pieces, readers such as myself might wonder why they are collected within the same volume; nevertheless, I also feel that these translations contribute greatly to our understanding of the original texts, some of which are understudied. While labels such as music, performance, gender, and translation may serve as convenient directional pointers, the richness of the essays in this volume far exceeds what these rubrics immediately imply. Indeed, many pieces actually traverse multiple (sub)disciplines, Judith Zeitlin’s and Stephen West’s essays being representative. In Zeitlin’s essay, the musical text in seventeenth-century plays and songbooks becomes a useful venue for investigating both issues directly linked to music and performance and questions of vernacular literature, print culture, and book history. Stephen West’s study of self-help guides of the Yuan dynasty also engages multiple areas (e.g., print culture, urban culture, popular texts, and genre), illustrating to us “an urban world, one in which widespread material wealth and print culture combined to nibble away at the prerogatives of the literati” (p. 138). In sum, this is an extremely rich collection of essays. As the editors of the volume put it, this collection of essays “bears witness to the huge advances that the study of Chinese culture has made since the 1970s, when [Wilt Idema] started his career” (p. 1). Having benefitted from Idema’s impressive scholarship both as a reader and as a long-distance student of his, I can understand why he inspired so extensive a Festschrift. 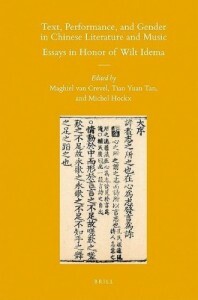 The bibliography of Idema’s numerous publications–a long list of his books and articles on Chinese literature and culture and translations of pre-modern Chinese works–included at the end of this volume shows the enormous scope of his scholarship, and will also be useful to researchers of Chinese literature. Finally, a few remarks on the potential audiences of the volume. Particularly strong in areas of performance, music (and sound), and gender (especially late imperial women writers), this volume will be helpful to readers interested in these topics. Teachers and students of Chinese literature may also find the translations included in the volume useful. Since half of the essays are devoted to the Ming-Qing period, I imagine this volume would particularly appeal to scholars of late imperial Chinese literature and culture. As it covers a wide assortment of genres–traditional and modern poetry, zaju, chuanqi, vernacular fiction, self-help guide,tanci, internet forum posting, etc.–this volume may also be useful to those who are interested in genre studies and literary history.
. Take, for example, a few important works published in the past two decades: Dorothy Ko, Teachers of the Inner Chambers: Women and Culture in Seventeenth-Century China (Stanford: Stanford UP, 1995); Susan Mann, Precious Records: Women in China’s Long Eighteenth-Century (Stanford: Stanford UP, 1997) and The Talented Women of the Zhang Family (Berkeley: University of California Press, 2007); and Ellen Widmer, The Beauty and the Book: Women and Fiction in Nineteenth-Century China (Cambridge: Harvard University Asia Center, 2006).